Carolyn Thomas is running a class here at Viney Hall on Friday mornings at 9.15 am suitable for beginners and intermediate abilities. Phone for more information. There are many traditions and styles of yoga and each teacher has their own focus and style. Carolyn teaches Hatha Yoga, guiding students to work at their own individual level “listening” to the signals their body gives them. Breath and movement are used separately and together to create a mindful practice. The postures taught are likely to be familiar across many yoga traditions. 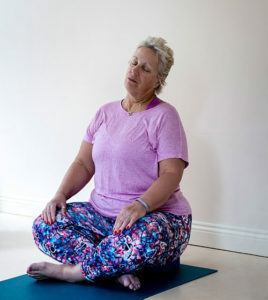 Simple breathing practices are used which provide tools to help in day to day life in managing stress and difficulty in sleeping. Each class starts with a few minutes stillness, Followed by gentle warm-ups preparing for postures and sequences to mobilise, stretch and strengthen the body, working towards improved stability, flexibility and balance. The session ends with a period of relaxation. Breathing practices will be woven throughout the class. The aim is that students will feel stronger, stretched, supple and energised yet peaceful at the end of each class. Booking may be made online or by telephone 01594 516810 with priority will be given to current class members for one week. I am so pleased with my progress, Pip is so helpful with suggestions and advice. Will recommend her and the practice as I already do.